Every Easter, we fill plastic eggs with spare change and small goodies like bouncy balls, plastic animals, rings, stickers, and essentially whatever we can find on sale throughout the month. We ask friends and family to bring 12 candy-free filled plastic eggs for a children's egg hunt, a dish to share and have an Easter Potluck Picnic and Egg-Free Hunt. We begin the day with Sunday service then head home to meet friends and family for a fun day of food and egg hunting for all. I have asked everyone ahead of time to bring either a side dish, salad, or dessert and we supply the paper products, drinks, and main dish. It is always fun to see what everyone brings as their family's favorite Easter dish. After lunch, we gather the children and entertain them with a craft while the men in the group hide the Easter eggs. Why do the men hide? Tradition. Then, the boundaries of the hunt are established, rules for respecting the tiny tots are explained, and a whistle is blown. If there are toddlers in the bunch, we usually let them go out for a little while first and we make clear that the eggs in plain sight are for them. Once the hunt starts, the parents sit back and giggle as the kids search high and low for the plastic eggs. For those who are concerned with fairness, we sometimes let the kids gather as many eggs as they can then give each child a goodie bag instead of filling the eggs. While I think that it is good for the kids to learn that they may not always have the most, it is certainly nice when we do not have to fill all of those eggs! But, the fun does not end here... the adults hunt, too. Oh, and this is the best hunt of the day! Sometimes, we let the men hide for the women and the women for the men (and the kids help hide for both). Other times, we allow one person from each family to hide and one to hunt... the family must decide who. And, what adult is motivated to hunt for rubber dinosaurs?! Certainly not this one! So, we make it interesting. Each adult plastic egg is worth an small amount of change (written on the egg or on a paper inside). But, one egg... THE GOLDEN EGG... is worth a large amount. Each family is asked to contribute $5 or $10 dollars per adult who will hunt. The adult who finds THE GOLDEN EGG gets all of the money in the mystery pot. (Basically, this is the amount of money left over after deducting the value of the small change used in the other eggs.) If you decide to do this, please realize that often times, some eggs are never found. That means, there will be money hidden out there is you decide to place the money in the egg. For this reason, we like to write the amount inside of the egg. One last element of the egg hunt that I have not mentioned.... the Resurretion Eggs. I felt a burden that, during the most important of the Christian holidays, we are obsessed with money, eggs, and food. So, I decided to add Resurrection Eggs to the hunt. Resurrection Eggs are eggs that contain an item which symbolizes something related to the Easter story. You may buy these online or make your own. Either way, as the children find these eggs among the other eggs in the hunt, they hold them until story time. Then, when I ask for certain eggs, the will open them. The items in each egg will guide me through the story. 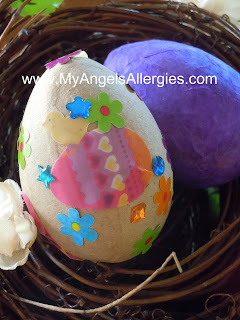 I found this activity to be a highlight for the kids and a great activity to restore a deeper meaning to the traditional egg hunt. I hope that your Easter is full of family, fun, and the blessings of Christ!